Do any of you play the drums, or am I the only one? Re: Do any of you play the drums, or am I the only one? I was there three years ago. I blame this on my friend from work who bought an inexpensive e-drum kit for his children to play (actually he bought it for himself). Often times we would have three guitarist in one room (co-workers) so why not give the drums a try. I have been addicted ever since.... Started with a Rolland TD-15KV and had to get the two other trigger positions filled. That was fun and still is today but had to have the real deal so I moved up to a middle range acoustic set. I still cannot play the drums either....getting better at it (me thinks). Awesome instrument to get some frustrations out or just to make noise. Good workout too as I have lost some weight since I have been playing. I never break a sweat playing guitar or bass unless it is hot out. It's not the best drum on the world but It's my best drum gears on my life. My father gave me them in my 23's birthday. 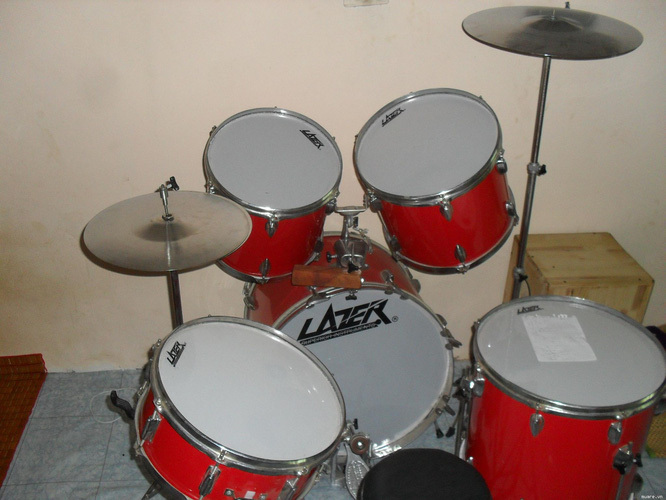 I'm an engineer but I have the love for music, especially drums and learn it by myself. I won't regret stopping learnt higher education for a drum class xD. Awesome drum kit. Sometimes the vintage kits have a lot of life in them. I am new to drumming and never played drums prior to March of 2015. I had thought I started in 2014 but was mistaken. So I played for 2 years now. Never really practiced as much as I did with the guitar and found I only played the drums when I was composing music (added drum tracks last). I did finally get a full drum kit recording and used an old project for the drumming. Deleted the e-drum tracks I made with the Rolland TD-15KV drum set. Acoustic drums are definitely different, take more effort and sound so much better. Still learning new tricks as well as tricks for recording.... Had to order some -20dB pads for the Tascam as I found the outputs were a bit too much for the inputs by 20dB. Max level on the mic inputs of the Tascam is +2dBu, the Soundcraft pumps out +21.5dBu. May explain part why there was signal shift in the recording as the compressor during mastering was adjusting levels. This past weekend I went shopping for some accent or effects cymbals and possibly a new snare to shake things up a bit with the drum kit. Always need more cymbals right? Well not necessarily. What does matter more than that is the snare drum. I do like the one that came with the kit, however I felt it was lacking something. I was looking for a deep snare more than 6 inches and having more than 8 lugs. Was interested in trying out a Gretsch artist Mark Shulman snare but could not find one locally. The clerk at one of the stores said he had a few that would blow my mind more so than the one I inquired about. Played a few in the store and decided on one that I thought had all of the features and construction quality that would be satisfying. I came home with a Ludwig 6.5x14 Black Beauty. Lets just say it is amazing. I could not believe what I was hearing and actually made playing the drums more enjoyable. I have also learned a few things based on my first recording session prior to getting the snare drum. Will have to see how things work out this weekend. I am really wanting to get the JP-2C into the mix as I have not worked that into a project yet. Actually with the new mixer on board, will have to also dial in the RA100 and see how that works. I was not the verge of getting another drum set, Tama Starclassic Performer B/B 5 pc shell pack with an extra 8 inch to go with it. The Maple Gretsch kit is nice but waned something a bit warmer in tone. The Evans hydraulic heads sounded great until I got another snare drum. Wound up with some new heads to try out, Remo Emperor Suede heads. Now those give me the tone I was hoping for. The hydraulic heads were worth while but the Emperor White Suede heads are a much better choice for me at the moment. Also first time I was able to get a 2B on the 16 tom where it did not sound like you were striking a paper bag. Still prefer a 2C#. Had to get the Mesa TC-50 and put off the next drum set for next year if at all. WOW WOW, no no... these legendary kit!!!!! I wish I could go there and play them! Last edited by braveluke on Thu Sep 21, 2017 11:22 pm, edited 1 time in total. The Remo Emperor heads were the ticket to awesome drum tone. I prefere the stock head on the Ludwig snare drum though. I did find almost local music shop in NC (2 hour drive) that had the Tama set I was interested in but in a different color. I did not care much for the moving floor tom. The tom suspension system also was not to my liking. I guess I made the right choice to get the Mesa TC-50 after all. Plus the money I was saving for the Tama drum set was enough to get another killer guitar that I found by chance. Kiesel DC600 with piezo Floyd Rose bridge. I am extremely impressed with it. I may get around to adding a few more items to the drum set I have now. A 24 inch kick drum would be interesting or perhaps an 18 inch. Wonder what is available that would match the set I have now. Will have to check. May even get a set of roto toms since I am a big fan of Pink Floyd and there are a few songs that use them.